There is an easy and quick way to lighten your bike, lower its center of gravity, and marginally improve its dynamic performance for $200 or less: the starter battery. Lead-acid, absorbed gas mat, and gel batteries have been around for years now, and while they provide cheap, reliable, and robust performance, they are obtrusively heavy and large. In terms of packaging and placement, most bikes have them mounted high and away from the center of gravity; basically, it’s like carrying around a brick at arm’s length all day. Luckily, the market for starter batteries has been moving in the direction of new battery technologies with the latest iterations utilizing lithium iron phosphate chemistries. These batteries are not plagued with the same issues that lithium ion batteries faced (read: exploding when cycled improperly), and are more environmentally friendly and theoretically last longer than the equivalent lead-acid or AGM battery. We had two companies send us their most popular models for testing and we came away impressed with the weight savings, performance, and overall value that they had to offer. 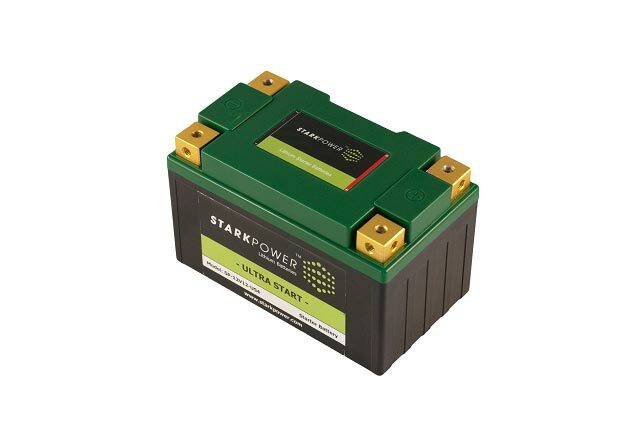 Stark Power, a relative newcomer to the powersports battery market, sent us their 18 amp-hour Ultra Start 4 (US4) LiPO4 starter battery, along with a diminutive 8 amp-hour “performance/race” starter battery. The former weighed in at 2.10 lbs and rated at 500 cold-cranking amps (CCA), while the smaller black case battery weighed in at approximately one pound and is rated at 180 CCA. Both batteries feature internal microprocessors which control cell balancing. The US4 also incorporated an innovative “Ultra Start” feature, which automatically switches the battery off when the voltage reaches a certain threshold. This is to ensure that there is always enough juice left in the battery to restart the bike. I found that the 8AH small battery to be adequate if you bike does not have high wattage driving lights or other accessories that are going to tax the charging system beyond its limits. The 18AH battery has plenty of juice in case you need to run a few accessories intermittently that are going to draw the battery down. Yes, it weighs a pound more and is approximately two and a half times the size of the smaller battery, but it also has the added feature of “Ultra Start” which works well enough for its intended usage, but was a tad wonky (sometimes switching the battery on or off and on again and then off). As an added plus, both Stark batteries ship with battery chargers. 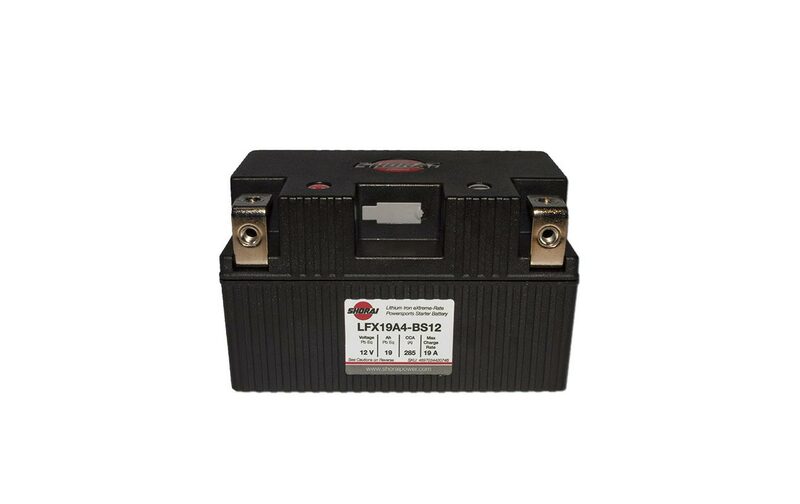 Shorai sent us their LFX19A4-BS12, which is a rated at 285 CCA with 19Ah capacity. The Shorai feels a bit better built than the Stark battery with a more high-end feeling case design. Although it has a lower CCA rating than the US4, in my testing it performed just as well as the Stark battery. At 2.31 lbs, it is just a tad heavier than the US4 and does not have the neat “Ultra Start” feature that the Stark battery does. In addition, the terminal design of the Shorai is not as versatile or flexible as the four-corner terminal design on the Stark US4 battery. Additionally, the Shorai battery does not ship with a charger. Overall, both the Stark and Shorai batteries performed the task of starting the bike and running accessories all while coming in at six to nine pounds less in weight. The cold weather starting was a bit anemic but once the battery had warmed it was not a problem. Prices currently are about 1.5 to 2 times the price of the equivalent flooded lead-acid or AGM battery. The Stark power US4 and the smaller 8Ah powersports battery are $220 and $120 respectively. The Shorai battery costs around $200. However, what you get is a battery that will last longer and perform as good at an 80% weight savings. So next time your battery gives up the ghost, consider a LiFEPO4 replacement. Do you have experiences with starter batteries incorporating this chemistry? What have your experiences been? Some die-hard adventure tourers swear-by their 15-20lb 24Ah as proven reliable and higher performing in cold weather. We would be interested to hear if any tourers out there have adopted a lighter battery and how well it has performed for them, especially when the temperatures have dropped. Note: As always, Asphalt & Rubber received no compensation for this article, though both Shorai and Stark Power provided demo battery units free of charge for review.